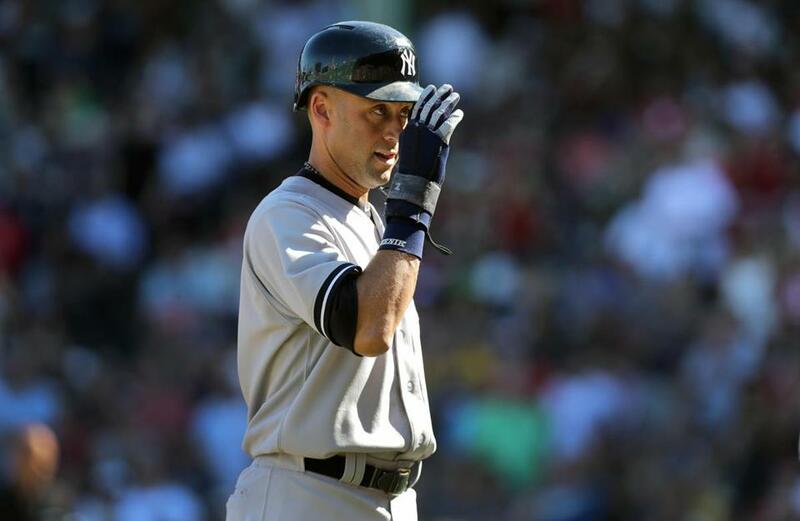 Derek Jeter acknowledged the Fenway Park fans as he headed to the dugout in the third inning. Derek Jeter has been exemplary, without doubt. But he is human, and don’t think there isn’t an ego, because if there wasn’t he would have done the totally menschy thing by moving to third base when Alex Rodriguez joined the Yankees in 2004. Everyone knew A-Rod was a better shortstop, but Joe Torre wasn’t going to risk WWIII in the Bronx by moving the sainted Captain to third. It also was probably asking too much of him to move voluntarily out of the No. 2 spot in the batting order when he was suffering through long dry spells at the plate this year. But it would have been yet another menschy thing to do. So, the man is not perfect. If you prick him, he will bleed. But in the last quarter-century of major league baseball there is no player I’d rather have at my disposal for 162 games and, more often than not, beyond. Anyone who wants a human blueprint of how to play baseball, and how to be a baseball player, need go no further than study the extraordinary career of Derek Jeter. Until further notice, he is the standard by which all future ballplayers will be measured. 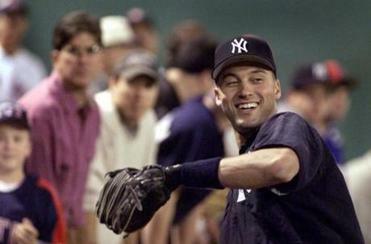 A look at some of the best shots of Derek Jeter through the years taken by Globe photographers. No one appreciates what he has done, and how he has done it, better than fellow icons. Yes, indeed, actual and drop-dead future Hall of Famers from other athletic disciplines know a truly exemplary player when they see one. “I love the way he has carried himself and constructed his legacy,” lauds John Havlicek. “He does things the right way, on and off the field,” confirms Tom Brady. These are people with a combined 53 seasons of high-caliber, Hall of Fame (I kind of think it’s OK to project Tom in) performance. In addition, these are people who have earned the unqualified respect of every segment of the athletic community for the dignified, classy, professional, and, yes, exemplary way they have gone about their business. And they view Derek Jeter as a paid-up member of the club. “I feel like I know what kind of guy he is without even knowing him,” says Bourque. For the record, one of them actually has made his acquaintance. It turns out Jeter probably went one year too long, which is hardly uncommon, and though his bat awoke last weekend after a lengthy slumber, his numbers this year are dreary enough to allow some critics a forum to denigrate his entire body of work. This is, frankly, preposterous. A reasonable case can be made that Derek Jeter is the best all-around shortstop of the last 97 years, or, to put it another way, the post-Honus Wagner era. No, he never won an MVP award, which doesn’t mean he shouldn’t have. He didn’t lead the league in all that many statistical categories, either. What he did was show up, play his position well, and keep grinding and grinding, game after game, trying to help his team in any way possible. I consider Derek Jeter the best pure baseball player of the last quarter-century. He hit for average. He wasn’t a home run hitter, but he could hit a home run. He played a position where hitting lots of homers is not a job requirement, but he had double-figure home run years 16 times. He wasn’t a base stealer, but he could steal a base. From 2002-06 he stole 114 times while being caught 22 times. And I would bet my house, two cars, and maybe even my box set of Ray Charles goodies that he didn’t waste time stealing superfluous, look-what-I-can-do bases. Rather, I’m sure he stole tough-situation bases when the team needed a man in scoring position with the game outcome in doubt. He did, in fact, lead the league in hits twice — 13 years apart. Think about that. “He brings it, every game, 162 games a year,” salutes Brady. “A true professional, with the work ethic, dedication, and passion for the game,” says Bourque. As do all great players, in any sport, he leaves us with indelible images. The man had style. You know he’s going to echo Kareem Abdul-Jabbar, who took that hook shot with him when he retired, by storing that jump-pass throw from the Tony Gwynn 5.5 hole back home in Tampa/St. Pete after Sunday. That batting ritual, culminating in the imperial nod to the pitcher that now it’s OK to throw? Pure Derek. It goes when he goes. Oh, and that clever, infuriating jackknife thing he does with an inside pitch? You’ll never see that again — anywhere. All Derek’s. I think the government granted the patent back in ’05. All that’s left is the final evaluation. He can start working on the Cooperstown speech, but who doesn’t know that? It’s part of the deal that we sports fans rank guys. Honus Wagner will forever be acclaimed the greatest shortstop, and never mind that he finished playing almost a hundred years ago. But who’s No. 2? Cal Ripken? Ozzie Smith? Go ahead. Name someone else. Cal had more power and he played in all those games. The Wiz flashed that leather and had more offense than you might think. I’ll take Jeter. No. 2 shortstop of all time: sounds pretty good to me. I’m not a Yankees fan, so I’ll leave the impassioned arguments to them. But from an outsider viewpoint, I would rate the Yankees Great Eight as follows: 1. Babe Ruth; 2. Lou Gehrig; 3. Joe DiMaggio; 4. Derek Jeter; 5. Mickey Mantle; 6. Yogi Berra; 7. Whitey Ford; 8. Mariano Rivera. Starting five on the all-time Yankees team? That also sounds pretty good to me.